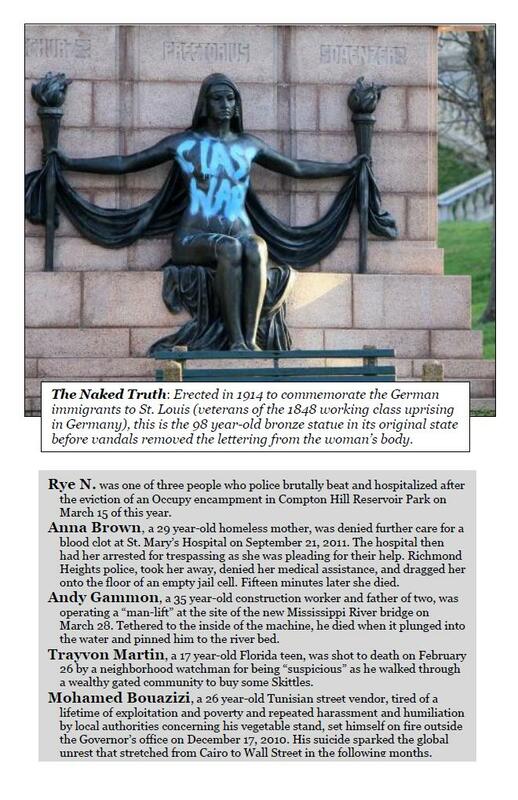 [Caption for statue photo:] The Naked Truth: Erected in 1914 to commemorate the German immigrants to St. Louis (veterans of the 1848 working class uprising in Germany), this is the 98 year-old bronze statue in its original state before vandals removed the lettering from the woman’s body. 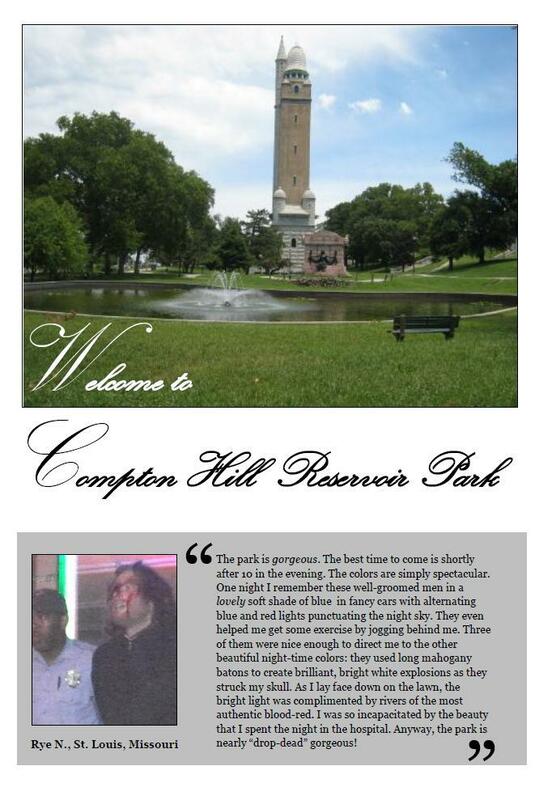 Rye N. was one of three people who police brutally beat and hospitalized after the eviction of an Occupy encampment in Compton Hill Reservoir Park on March 15 of this year. 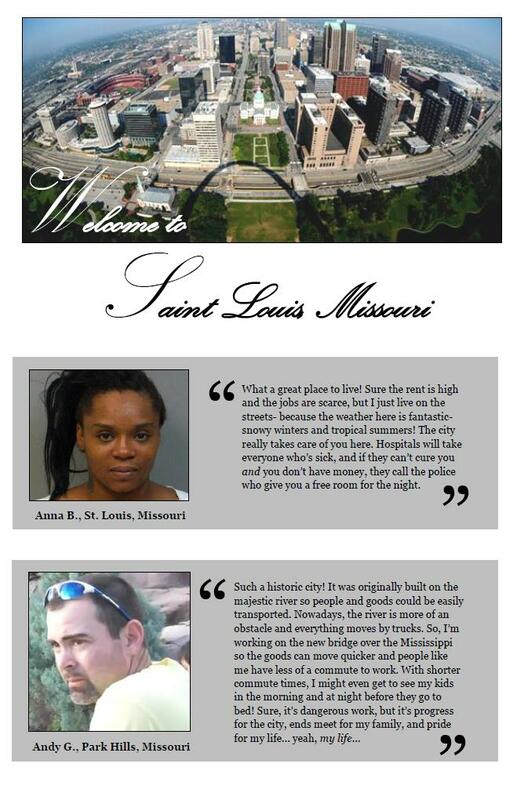 Anna Brown, a 29 year-old homeless mother, was denied further care for a blood clot at St. Mary’s Hospital on September 21, 2011. The hospital then had her arrested for trespassing as she was pleading for their help. Richmond Heights police, took her away, denied her medical assistance, and dragged her onto the floor of an empty jail cell. Fifteen minutes later she died. Andy Gammon, a 35 year-old construction worker and father of two, was operating a “man-lift” at the site of the new Mississippi River bridge on March 28. Tethered to the inside of the machine, he died when it plunged into the water and pinned him to the river bed. 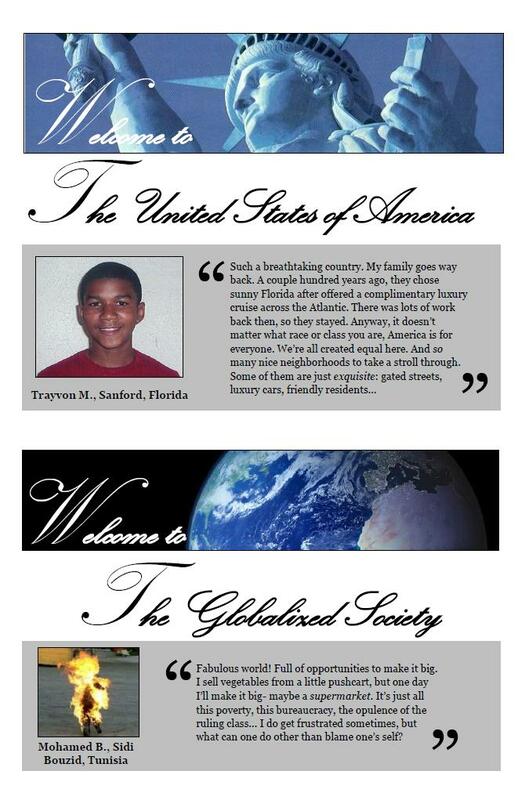 Trayvon Martin, a 17 year-old Florida teen, was shot to death on February 26 by a neighborhood watchman for being “suspicious” as he walked through a wealthy gated community to buy some Skittles. Mohamed Bouazizi, a 26 year-old Tunisian street vendor, tired of a lifetime of exploitation and poverty and repeated harassment and humiliation by local authorities concerning his vegetable stand, set himself on fire outside the Governor’s office on December 17, 2010. His suicide sparked the global unrest that stretched from Cairo to Wall Street in the following months.